A group of more than 50 loyalists gathered outside the primary school in a threatening manner on Thursday after earlier painting the kerbstones outside the school red, white and blue. The front gates of the school had to be closed in fear of a possible attack. Tensions have mounted in the area since British Union Jack flags were hoisted outside the school in December by loyalists at the start of the violence over a decision to reduce the flying of the flag over Belfast City Hall. Families of the schoolchildren said the trouble brought back painful memories of 2001, when those going to and from the school were forced to run a daily gauntlet of abuse and missiles, including urine, excrement and blast bombs. It was not immediately clear what prompted Thursday’s protest, but loyalists have engaged in serious violence in recent months in protest at what they perceive to be increasing nationalist political influence, particularly in Belfast. At the weekend, a major parade in support of UVF death squads saw over 8,000 loyalists march through the east of the city. Some journalists and photographers were later ‘escorted’ from the concluding rally. 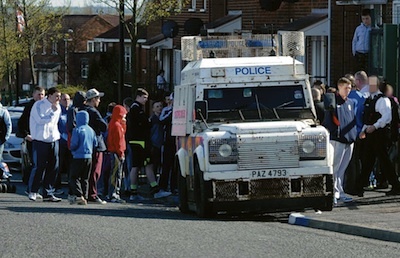 On Monday, there was a shock for the Holy Cross schoolchildren when loyalists painted kerbstones at the entrance to the school but nowhere else along the Ardoyne Road. Irish National Teachers’ Organisation northern secretary Gerry Murphy said he feared a return to the 2001 “corridor of hate” blockade. Meanwhile, the continued presence of UVF flags in east Belfast has raised tensions there. Hundreds of UVF flags had been placed along the parade route by masked paramilitaries ahead of the march. The flags continue to fly throughout east Belfast despite promises by loyalists that they would be taken down. SDLP justice spokesman Conall McDevitt said the removal of the flags would be a “major test” for the PSNI police. eirigi spokesperson Padraic Mac Coitir said the situation there again illustrated the partisan attitude of the PSNI and other agencies towards unionism.